We completely fell in love with the Philippines. For us it was one of the most welcoming and gay friendly destinations in Asia, particularly Boracay island. Boracay is one of the most popular islands in the Philippines and even has a small gay scene to explore. We visited to celebrate Seb's birthday and had a blast. Whilst there is a large party side to the island, there is also a more mellow chilled side to it, especially at Puka beach. This is our gay guide to Boracay featuring the most up to date gay bars, clubs and gay friendly hotels. In 2018, President Rodrigo Duterte ordered that the island is closed for an extensive cleanup because the waters around the island has become a giant “cesspool”. 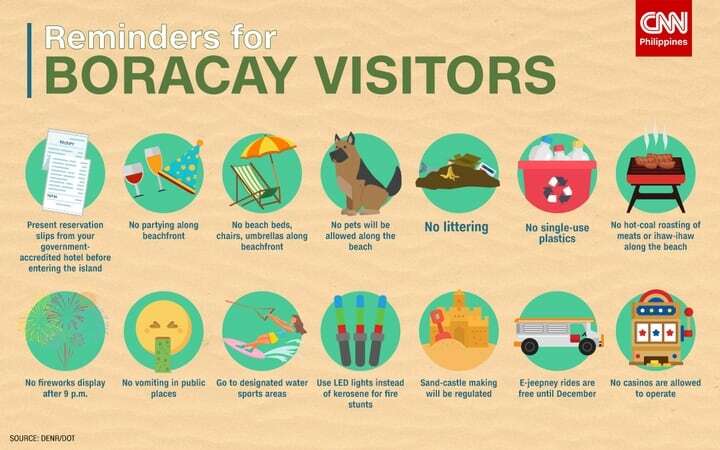 Therefore, between April to October 2018, Boracay shut down and the clean up went ahead. Today, the island is alive and well, but has strict conservation laws in place. For example, tourist numbers are limited to 19,200 at any one time (it used to be double that in the peak season), and banning boozing and smoking on the beach. Whilst Boracay will no longer be the party destination it once was, we don't quite see that as a bad thing! The main bulk of the nightlife in Boracay takes places around Station 2. The central point is the D'Mall, which is where the majority of the best bars, clubs and restaurants are. As such it's always very busy here, full of people, plenty of atmosphere, and of course, many pretty gay boys. OMBar: run by the same team who used to own Juice bar before re branding. OM is one of the cool gay friendly kids on the block, located in Station 2. It's open everyday from 4pm to 5am. JC Karaoke Bar: a gay friendly karaoke restobar in Boracay located further away from the busy strip of Station 2, next to Villa Caemilla in Station 3. This makes it a perfect place for a romantic drink rather than for party. JC Bar and Restaurant: super fun resto gay friendly bar in Boracay, located near Bulabog beach on the other end of the island. It's open every day till 2am. There are many excellent gay friendly hotels in Boracay to suit all budgets. You could spend as little as 300 pesos (£4/$7) for a dorm bed to several hundreds of dollars for a room in a luxury resort. We never experienced any homophobia in Boracay, or any difficulties getting a double bed. We found Filipinos to be very relaxed and open-minded towards LGBTQ tourists. The places we recommend below are 100% gay-friendly, so you can freely wave your rainbow flag at the door. Mandala Spa is the ultimate romantic experience on Boracay. We stayed here for 2 nights and loved every second of it. It's one of the best romantic hotels we've stayed in during our big trip in Asia and highly recommend it. The staff are super friendly and welcome gay couples with open arms. At Mandala Spa you can purchase a “package” which along with your luxurious villa also includes a mix of spa treatments, yoga classes, dance classes and dining at their in house restaurant. They have a rainbow package for gay couples, which is the ideal gift to spoil your partner for a special occasion. Packages at Mandala Spa start from $250/£170. Find out more in our review about Mandala Spa. We stayed for 3 nights at Villa Caemilla and absolutely loved it. It's located right on the beach front far enough away from the touristy crowd at Station 2, but close enough to be walking distance near all the good restaurants and bars. Our favourite thing about Villa Caemilla is that it has its own private beach front just for guests, surrounded by palm trees and closely attended to by the smiley staff. A double room at Villa Caemilla starts from $125/£88. Read more about it in our review about Villa Caemilla. We stayed here for Sebastien's birthday and ended up getting really friendly with the staff who took us around Station 2. They made it very special for us and we can't recommend it highly enough. This is ideal for couples looking for an affordable romantic stay. Rooms at the Ferra Hotel start from $60/£40. Los Indios Bravos: we chose it because of the many excellent Tripadvisor reviews and celebrated Sebastien’s birthday dinner here. We had some delicious Filipino foods like kinilaw (similar to ceviche), which re recommend. It's slightly hidden away from the busy touristic D'Mall area in Station 2, but despite this it still gets very busy. Lemon Café: we had a delicious Sunday brunch here with our friends following a heavy Saturday night of partying. Lemon Cafe is in the D’Mall so it's always buzzing with atmosphere. Our favourite was the hearty salads and the delicious lemon cheesecake. 357 Boracay: we had another romantic dinner, this time at this cute beach front restaurant. It's located at Station 3, away from all the party atmosphere at Station 2, so has a very peaceful atmosphere. The ribs here are their specialty, which are delicious! You just have to do it, whatever the occasion! We took a course, learning to swim like a mermaid, which is not only a satisfying work out, but also a lot of fun. The Philippines Mermaid Swimming Academy runs excellent mermaid classes on White Beach. For Seb's birthday we wanted to take a boat trip. After searching Tripadvisor, we found Boracay Explorer, who offers a boat trip to the nearby Carubao island with all food and drinks included. Carubao has many gorgeous beaches, lined with palm trees and fortunately sees very few tourists. We came for the day and had the entire area to ourselves, then explored the rest of it on motorbikes. The staff of Boracay Explorer are extremely gay friendly and welcome to everyone. This is idea if you’re a large group of gay guys looking to party and want an isolated beach all to yourself. If you want to escape the busy crowds of White Beach around Station 2, we highly recommend checking out Puka Beach, located at the northern tip of the island. It's a paradise here, and only 20 minutes tricycle ride from D'Mall. For us Puka Beach was the best beach on Boracay island. It's more isolated than Station 2, so has little development. The atmosphere is very relaxed and the water is gorgeously clean, ideal for swimming. It's a popular spot for gay guys, and we noticed a few cruising in the afternoon hours. You will find many places offering massages and spa treatments on the beach and also in town. We personally recommend the gay friendly Mandala Spa resort, which we tried it and loved. We spoiled ourselves with a package of treatments which includes a Royal Footbath, a Cleopatra Milk Bath and their Asian Signature Massage. Awesome info! Thanks so much, my partner and I are going next month and it’ll be our first time there, so we’re excited and nervous at the same time. Your blog was very helpful! what is the most comfortable way of getting to Boracay. By flights or boats or..? Wow what a story ? Thanks Stefan for this awesome travel blog! Very helpful. And may i say you two are a very beautiful couple! Love love love! Would love to hear more of your wonderful travels in our country. Hi there would you choose to go to Boracay or to Palawan if you could just choose one? Im filipino and I am now in boracay for the #laboracay yearly event. I had so much and so many hot guys. The place is very crowded. I had fun because I want to party with great a great beach but I actually prefer palawan because the locals in palawan are the friendliest and they will not ask you for any tip unless you offer. Moreover, palawas has great islands, beaches, views omg I really want to go back there. Agreed – Palawan is beautiful!! Thanks Alex – really appreciate the info. Hi I was wondering if any clothing optional beaches exist on the island?? Thank you for the recommendations – very helpful! We are there right now in Dec 2015. Just FYI, unfortunately Juice bar and Cork bar have both closed. Looks like there’s a need for new gay bars in Boracay! Oh no no way? Since when? Thanks so much for telling us.